Persons who worked, even for a few days, in 2016 was 53.3% of the total 16 years and over population in the CNMI in 2017. The percentage of persons who worked in 2016 was practically the same in all three islands: 60.2% in Tinian, 59.6% in Rota, and 59.2% in Saipan. The percentage of persons who worked in 2016 was highest in Districts 2 and 3 (both 63.0%) and was lowest in District 5 (51.1%). The median number of weeks worked, for all persons who worked in 2016, was 52 while the mean was 48.1. Those who worked for 52 weeks was 81.0% of all persons who worked in 2016; Those who worked 40 to 51 weeks was 8.5%; while those who worked less than 40 weeks was 10.5%. The median number of weeks worked was higher in Saipan and in Tinian (both 52.0) than in Rota (48.0) while the mean was slightly higher in Saipan (48.6) than in Tinian (46.9) and in Rota (46.3). The percentage of workers that worked 52 weeks was higher in Saipan (82.2%) and Tinian (82.4%) and lower in Rota (51.7%). The percentage that worked 40 to 51 weeks was higher in Rota (32.3%) than in Saipan (7.7%) and in Tinian (3.1%). The percentage that worked less than 40 weeks was higher in Rota (16.0%) than and in Tinian (14.6%) and in Saipan (10.0%). The median number of weeks worked was the same in all districts (52.0), while the mean ranged from 46.8 in District 2 to 50.8 in District 4. The percentage of workers that worked 52 weeks was highest in District 4 (93.2%) and was lowest in District 1 (76.3%). The percentage that worked 40 to 51 weeks was highest District 1 (15.3%) and was lowest in District 4 (3.3%). The percentage that worked less than 40 weeks was highest in District 2 (16.0%) and was lowest in District 4 (3.5%). The median number of weekly hours worked, for all persons who worked in 2016, was 40 while the mean was 39.1. Those that worked for 40 hours a week was 85.4% of all persons who worked in 2016; those who worked less than 40 hours a week was 10.1%; while those who worked more than 40 hours a week was 4.6%. The median number of weekly hours worked was the same in all three islands (40.0), while the mean was higher in Saipan and in Tinian (both 52.0) than in Rota (48.0), while the mean was practically the same in all three islands: 39.1 in Saipan, 38.8 in Tinian and 38.5 in Rota. The percentage of workers that worked 40 hours a week was higher in Saipan (85.7%) and Tinian (85.6%) and lower in Rota (78.5%). 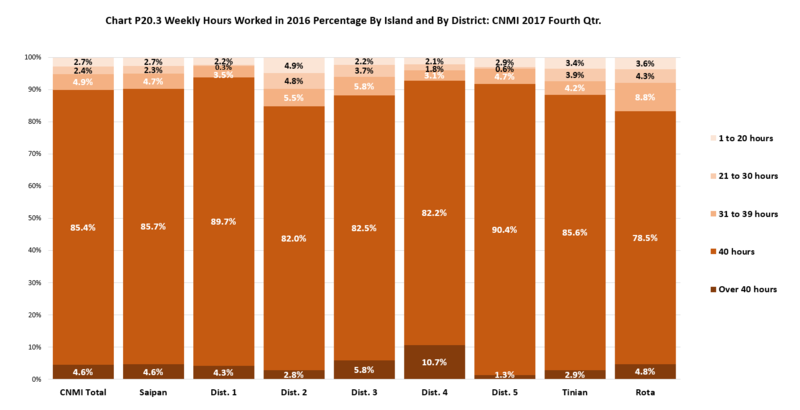 The percentage that worked less than 40 hours a week was higher in Rota (16.7%) than in Tinian (11.5%)and in Saipan (9.7%). The percentage that worked more than 40 hours a week was higher in Rota (4.8%) and in Saipan (4.6%) than and in Tinian (2.9%). The median number of weekly hours worked was the same in all districts (40.0), while the mean ranged from 38.3 in District 2 to 40.2 in District 4. The percentage of workers that worked 40 hours a week was highest in District 5 (90.4%) and was lowest in District 2 (82.0%). The percentage that worked less than 40 hours a week was highest in District 2 (15.2%) and lowest in District 1 (6.1%). The percentage that worked more than 40 hours a week was highest in District 4 (10.7%) and was lowest in District 5 (1.3%). LFS 2017 Table P20.1 Worked in 2016 by Island and by District: CNMI 2017 Fourth Qtr. LFS 2017 Table P20.2 Number of Weeks Worked in 2016 by Island and by District: CNMI 2017 Fourth Qtr. 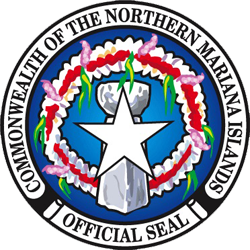 LFS 2017 Table P20.2 Median & Mean for Weeks Worked in 2016 by Island and by District: CNMI 2017 Fourth Qtr. LFS 2017 Table P20.3 Weekly Hours Worked in 2016 by Island and by District: CNMI 2017 Fourth Qtr. LFS 2017 Table P20.3 Median & Mean for Weekly Hours Worked in 2016 by Island and by District: CNMI 2017 Fourth Qtr.